The SUV and crossover market in the U.S. is white hot, and to remain competitive, automakers have been rolling out new turbocharged powertrains, more gears in their transmissions, and often a variant that at least appears to have some semblance of off-road capability. So what is GMC's done with the new 2020 GMC Acadia. It's got standard C-shaped LED headlights, a squared-off grille that droops down on the bottom corners, and a revised rear fascia with new taillights and a different shape to the trim bar above the license plate. I think the back looks okay, but the front looks downright handsome. For a crossover, that is. For the first time, the Acadia's SLE, SLT and Denali trims are joined by AT4, which is GMC's new "off-road" sub-brand launched with the 2019 GMC Sierra. But unlike the pickup truck, the Acadia AT4 does not get a lift kit, ski plates, Rancho shocks, or a locking differential. No, the Acadia AT4 — which comes standard with the 310 horsepower V6 and a twin-clutch AWD system — is more of an aesthetics package, adding black chrome accents to the exterior, unique 17-inch wheels, and standard all-terrain tires (which, if I'm honest, look pretty nice with all of that sidewall). 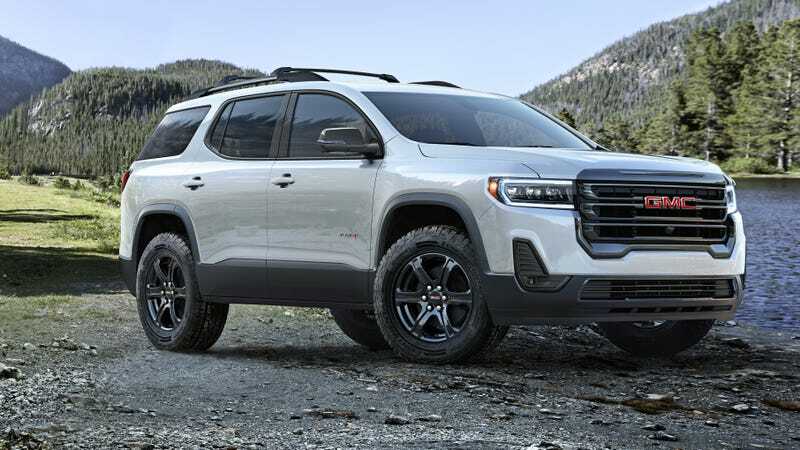 To be fair, in its press release, GMC really calls the AT4 a true off-road variant, only using the term to describe the styling, saying the vehicle gets a "rugged, off-road-inspired design." engine joining the naturally aspirated 193 horsepower 2.5-liter four and 310 horsepower 3.6-liter V6. The new engine is a variant of the 2.0-liter found in the Cadillac XT4 crossover, and makes 230 horsepower at 5,000 rpm and 258 lb-ft or torque at 1,500 rpm – the same torque as the Caddy, but seven horsepower gets. ] All of the Acadia's engines now get bolted to a nine-speed "Hydra-Matic 9T65"
automatic instead of a six-speed, which was the only option in the 2019 model. GMC also says it's improved the Acadia's infotainment system with a higher resolution screen and better voice recognition, and that the User interface is improved e "suspension refinements" (exactly what changes were made are not mentioned), some new wheels, LED turn signals in the mirrors, and other bits you can read about on GMC's media site. But really, the big changes are the new 2.0-liter engine, the nine-speed transmission, the "rugged" styling (especially on the AT4), and the push-button shifter. Most of those seem like decent improvements, but I've got to try out that gear selector before making a judgment. Because it looks wacky.